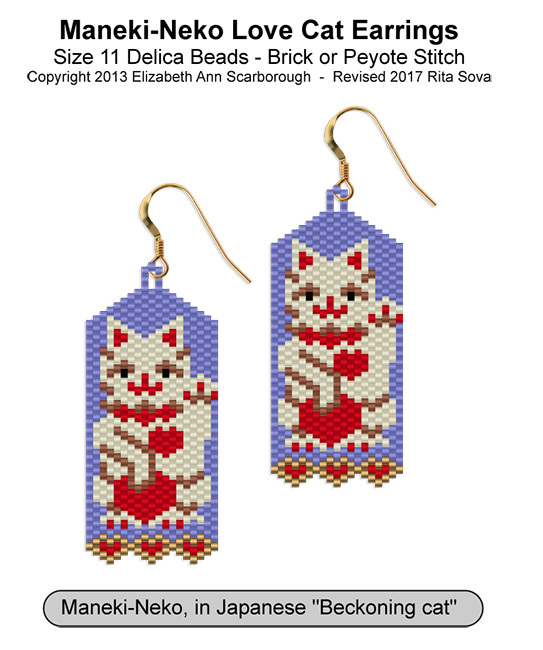 Maneki-Neko is the lucky cat or beckoning cat, this purrticular kitty is lucky in love. Symbol is famous throughout Japan for bringing good fortune of all kinds, especially to travellers. You will see cats similar to these at cash registers, holding the Japanese symbol for prosperity. (I didn't duplicate that here, just the little gold tablet, and indicated it instead by adding stick fringe with belly dance coins on the ends). One story is that a traveller passed a shrine and saw a cat sitting in front of it, beckoning with its paw. He went to see what the cat wanted just as a boulder crashed down from the mountain right where he would have been standing. Another story tells of an old woman so poor she had to sell her cat (we hope to a good home where it was allowed to chase mice and loved, petted and adored). After that, the cat visited her dreams and told her to fashion a cat who looked just like him, beckoning, and she became rich. Anyway, if you like cats, Japan and folk tales, it can't hurt! Word Chart for Odd Count Flat Peyote included. Color Graph with Symbols for Brick or Peyote stitch included. Size 11 Delica bead numbers and quantites are provided (6 colors). Finishing details are NOT included.